Found 16 file extension associations related to Electric Quilt and 5 file formats developed specifically for use with Electric Quilt. Electric Quilt is incredibly full-featured quilt design and drawing program has been especially designed with beginners as well as advanced designers in mind. 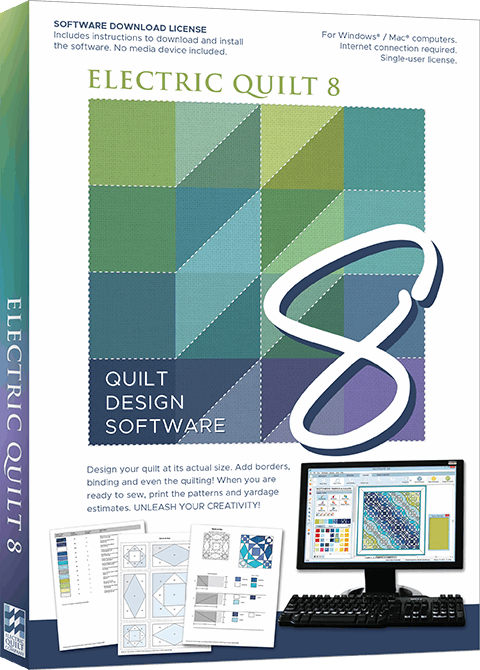 Use it to design quilts, draw blocks, scan in fabrics or select from over 20,000 blocks, fabrics, colors, embroidery, photos, threads, quilt layouts and borders included in EQ6. Use EQ6 simply to try out colors, or print patterns in any size. Or use EQ6 to forge a quilting career, producing professional, high-resolution block and quilt images print-ready for books or magazines. If you need more information please contact the developers of Electric Quilt (Electric Quilt), or check out their product website.